Documents released by state regulators Tuesday show that Ben W. Lupo, a partner in several companies that share an address at Salt Springs Road, directed employees there to dump up to 20,000 gallons of wastewater down a storm drain. Brine Spill Salt Springs Rd. Two state regulatory agencies are conducting a criminal investigation into how and why up to 20,000 gallons of suspected fracking waste were dumped into a storm drain near the site of the D&L Energy Group headquarters on Salt Springs Road. OhioEPA - Notice of violation: Division of Emergency and Remedial Response. The revelation comes five days after the incident, which occurred at Hard Rock Excavating’s headquarters, where a large storage tank, capable of holding up to 20,000 gallons of waste — including oil and brine — was being cleaned by an employee of the company. According to business records filed with the Ohio Secretary of State’s Office, D&L Energy is listed as the owner of the company. Lupo, D&L’s chief executive, is listed on those records as Hard Rock’s only authorized representative. He also is affiliated with several other companies that share an address at 2761 Salt Springs Road where the dumping incident occurred. Both the Ohio Department of Natural Resources and the Ohio Environmental Protection Agency received an anonymous tip late Thursday and were on the scene within three hours. They were able to obtain photographic evidence of the dumping taking place, a source inside ODNR told state Sen. Joe Schiavoni of Boardman, D-33rd. Emergency response teams from the OEPA, U.S. EPA and ODNR managed to collect samples of the dumped substance that are being analyzed. Workers continue to mitigate the effects of the spill, where the drain entered a Mahoning River tributary behind the Toys “R” Us Distribution Center on Geoffrey Trail just off Salt Springs Road and leaked an unknown amount of oil and brine into the river. However, the regulatory agencies have been reluctant to release further details as they plan to proceed with a criminal investigation, said Chris Abbruzzese, deputy director of communications for the OEPA. The secrecy of the matter prompted an outcry from some of Youngstown’s elected officials and members of the public who took to social media throughout the day Tuesday demanding more answers. A public-records request from both The Vindicator and state Rep. Bob Hagan of Youngstown, D-60th, led the OEPA to release a Notice of Violation and a preliminary incident report late Tuesday. The OEPA incident report also confirmed that ODNR inspectors witnessed the dumping around 7:30 p.m. and Lupo contacted the agency’s inspectors to accept full responsibility, but when he did so remains unclear. Abbruzzese said that although the Notice of Violation is not an admission of guilt, it is an acknowledgement of Hard Rock’s role in the incident. Hagan visited the site Tuesday, expressing his anger at the situation and the potential danger to the water supply, which officials at the Meander Reservoir, Youngstown’s water source, said was completely unaffected as the city does not draw its water from the tributary or the Mahoning River. Despite its ownership and Lupo’s affiliation with Hard Rock, D&L continues to deny its involvement. Bevacqua refused to make Lupo available for an interview, and attempts to reach him and other officials at the company by phone failed Tuesday. Schiavoni said he understood regulators’ approach in responding to the incident and getting the facts straight before releasing more details, but made it clear that as the investigation continues, state officials will need to take a hard line if any wrongdoing is proved. 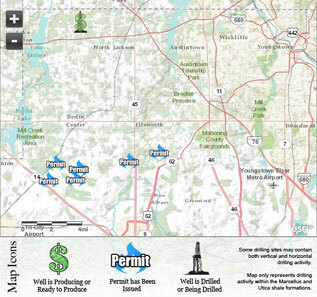 A Vindicator investigation in 2012 revealed that D&L has a history of at least 120 violations at 32 injection and extraction wells across Ohio and Pennsylvania stemming from citations levied by environmental regulators for failing to display a permit or contaminating water and soil. Under Ohio law, any company or individual found responsible for intentionally dumping brine is subject to either a fine of $10,000, six months in prison, or both, for a first offense. Repeat offenders are subject to a fine of $20,000, two years in prison, or both. Nathan Johnson, an attorney for the Ohio Buckeye Forest Council, said an operator that intentionally dumped brine into a storm drain could conceivably face charges from the federal government for violation of the Clean Water Act. Abbruzzese said that the facts of the criminal investigation would determine whether state or federal agencies have the power to pursue charges. Last week’s incident comes a little more than a year after an injection well operated by D&L was linked to a series of earthquakes in the area. That well, and four others in a seven-mile radius of it, are under indefinite suspension. For Hagan, the spill is good reason to force the oil and gas industry to specifically reveal the chemicals they use in the fracking process, which state law currently does not require.